Downy mildew of brassicas (Hyaloperonospora parasitica syn. Peronospora parasitica) is a fungal-like oomycete that can be devastating in cooler, wet weather. While the ideal temperature for downy mildew development is 8-16˚C it can infect in temperatures outside that range. Prolonged leaf wetness due to fog, dew, or evening irrigation can create ideal conditions for the pathogen to develop. Downy mildew is most devastating on younger seedlings where it attacks the cotyledons and hypocotyls. In larger plants, lesions often expand outward to the leaf vein which results in angular spots. Plants infected late in the season can cause losses due to internal discolouration and lowers the duration of which the crop can be stored. The pathogen also increases the plant’s risk to other pathogens such as soft rot bacteria. Figure 1. Downy mildew spores on the underside of a brassica leaf. White spores of downy mildew are produced on the underside of leaves and over time the top of the leaf becomes grey, yellows, and prematurely senesces from the plant. Spores are spread mainly by wind or by splashing during rainfall or irrigation. 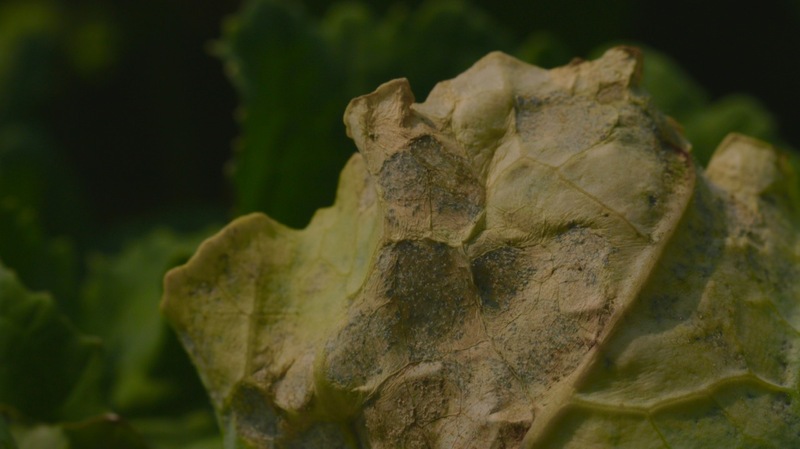 Black lesions can appear on cabbage heads while infected cauliflower plants can develop grey spots in the curds. Downy mildew can also create grey streaking in the florets of broccoli. Downy mildew spores overwinter on leaves and crop debris of compatible hosts. It is advantageous to remove crop debris, brassica volunteers such as canola or rutabaga and brassica weeds such as stinkweed, to reduce potential inoculum. Early plantings that have been harvested should be ploughed under as soon as possible after harvest as spores will continue to spread to younger plantings nearby. Always rotate with non-brassica crops. In the transplant greenhouse, improve air circulation to reduce humidity. Irrigate early in the day so leaves dry as quickly as possible and avoid smaller, frequent, irrigation events. Keep plants strong and avoid nutrient deficiencies that will increase the susceptibility to the pathogen. Breeders have identified several genes of resistance to brassica downy mildew and many new cultivars are resistant or tolerant to this disease. While there are many products registered for downy mildew, not all products can be used on all brassica crops. For example, Aliette WDG and Serenade Opti are registered for downy mildew control on all the brassica crops listed in Table 1, but Bravo ZN is only registered for use on the head and stem brassicas such as broccoli, cauliflower, cabbage and Brussels sprouts. Follow all other precautions and directions for use on the label. Remember to rotate between fungicide groups; the effectiveness of these fungicides in the future depends on the spray programs you choose today. Table 1. Products registered for downy mildew on selected brassica crops.